A new wave of sound has arrived - The ATON Storm Series speakers. Voiced in our sound labs by musicians with years of critical listening experience, all speakers were crafted for pure listening enjoyment. Each Storm Series model was tested against comparable models built by the industry's leading competitors. ATON's speakers possessed a consistent step up in sound quality, setting a new benchmark for ceiling speaker performance. All ceiling models feature 1" pivoting tweeters, excellent off-axis frequency response, high power handling, custom driver materials, and network components that provide the best price/performance ratio in the industry. Storm Series speakers are designed to blend in with any home environment. Each model features flat, unobtrusive profiles, paintable mesh grills and sleek perimeter trims. All Storm Series models are weather/moisture resistant and can be installed outdoors or in bathrooms and saunas. All models also carry a limited lifetime warranty, ensuring years of listening enjoyment. Pre-construction brackets are available for easy, reliable installation. 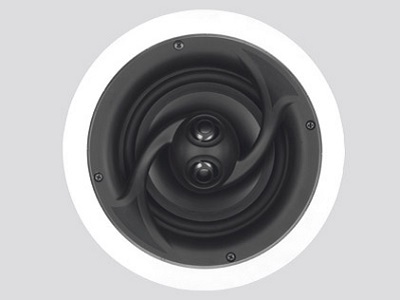 Delivers the same exceptional sound of a pair of stereo ceiling models in a single location speaker. Ideal for bathrooms, walk-in closets, hallways and other locations where space is limited and two separate speakers are not practical. Dual 3/4" aluminum tweeters are positioned at opposing angles to provide exceptional off-axis high frequency dispersion and detail.